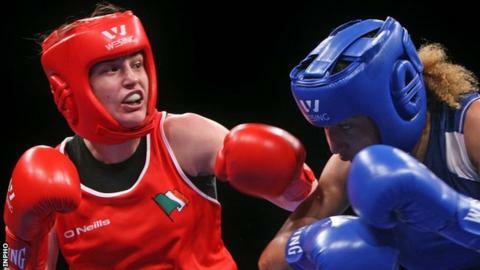 Katie Taylor won her fifth consecutive world title on a unanimous verdict at the AIBA Women's World Boxing Championships in Jeju, South Korea. The 28-year-old from Ireland secured gold by beating Yana Allekseevana of Azerbaijan in the lightweight final. The Bray woman's achievement brings her level with Indian boxer Mary Kom on five world titles. The 2012 Olympic champion has also won six European and five EU titles for a total of 17 major titles. Taylor was aggressive from the opening bell but her taller, southpaw opponent countered well in the first round. Two of the three judges had Taylor ahead 10-9 with the other giving it 10-9 to her rival. The Irish woman cranked up the pressure in the second round, landing a nice right hook on Allekseevna and winning the round on all three cards. It's an absolute privilege to equal Mary Kom's record, she's a hero of the sport. Allekseevna showed more in the third but Taylor landed a series of combinations to get the verdict from two of the judges once more and take a 30-27, 29-28, 29-28 lead heading into the final round. The Azerbaijani looked tired but was forced to go on the offensive in search of a stoppage. She wasn't able to hurt her opponent however, and Taylor counter-attacked ruthlessly to seal an assured overall victory by scores of 40-36, 39-37 and 39-37. Taylor reached the final after the trainer of her Chinese opponent Jinhua Yin threw in the towel at the start of the last round. Prior to that, she had been handed a quarter-final walkover after Russia's Sofya Ochigava was unable to fight. Ochigava, who Taylor narrowly defeated in the Olympic final in London, withdrew from Friday's bout because of a knee injury. "I'm absolutely delighted," said Taylor afterwards. "It was such a tight contest. Every round was very close and very tricky. "The tactics from my Dad and Zaur (Antia) were spot-on and I had to execute the game plan so well. "It was very tight but it's an absolute privilege to equal Mary Kom's record, she's a hero of the sport."